Instead of building The Amazing Meeting 8 up in my mind to be an awesome event, I decided to have no expectations. This was my first TAM and it turned out to be better than I ever could have imagined! As soon as I got to the Las Vegas airport I started to recognize big names in the skeptical community. The first was Paul Kurtz. A living legend was walking right by me and I think I was kind of staring at him. I also saw DJ Grothe, pointed at him and said, "that's DJ Grothe!" To which Ginger said, "don't point!" I felt like a kid in a candy store! I also met Joe Nickell and Brian Dunning in-person. I am big fans of both of their work and it was very surreal to be seeing and talking to them in the flesh. At one point I said, "Am I really standing here talking to Joe Nickell in the flesh?" To which Dr. Nickell replied, "No. I'm just a hologram. I'm not really here." I even got to take a picture with James Randi himself! He was very nice, approachable and he signed my copy of Flim-Flam! All of the speakers were the same way. Very warm. Very approachable. 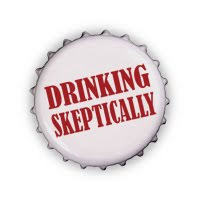 The only thing that was better than the talks was being among 1,300+ of my fellow skeptics. It was so invigorating mingling with fellow skeptics from, not only all over the United States, but all over the world. Skeptics that I met were from Canada, Ireland, England, and Australia! It feels good to know that attendance at TAM, events like TAM, and the skeptical community are all growing. It always feels good to know that you are not alone in the world. Another highlight for me was the Grassroots Skepticism workshop. It was so inspiring and motivating to get all kinds of ideas for our local skeptics group here in Cleveland. It was exciting to know that we are all struggling to organize in our own local communities and trying to expand the skeptical community. It gave me a lot of ideas and I cannot wait to help the Cleveland Skeptics to grow and thrive! If you have never been to The Amazing Meeting I highly recommend you attend at least one in your lifetime. Start saving now and go! Love the ice cream and pizza! Im so glad to read your post. im a skeptic too but, i wasn't able to attend that conference. well its really good to hear that our numbers are growing. we better keep it up, just like planning to lose weight, we will persevere in that to see the effect. good luck.